My kitchen was abuzz with excitement yesterday – the sounds of baking tins and saucepans clanking, whisking eggs, spoons scraping against the bottom of the bowl, happy and nosy children who were curious to see what I was doing. Scattered around the kitchen were bowls of fresh raspberries, stacks of chocolate, empty egg shells and dustings of flour. Wafting around the house were the gorgeous scents of pure chocolate and coffee, which was enticing and just a little bit magical. Despite how much fun I and the kids were having, there was a sense of urgency flowing through me. The reason all this was happening was that Nespresso invited me to participate in their competition to find Australia’s best chocolate raspberry brownies to celebrate their brand new Limited Edition Variations Club favorite, Cioccorosso, which features hints of dark chocolate and fresh raspberries. The competition for Australia’s best chocolate raspberry brownies only runs for 7 days, but, silly me who was too busy to even read her emails, l left it to the very last minute. 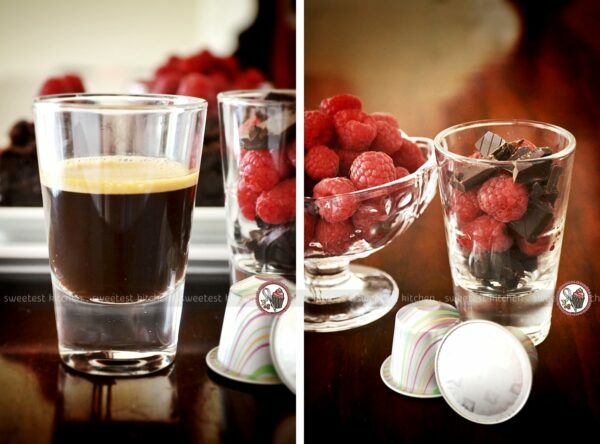 On Friday, I received a Nespresso Lattissima machine (on loan!) and 20 Cioccorosso capsules, plus a box of Nespresso chocolates. The competition closes Sunday night, so I only had 2 full days to get these brownies made, take pictures, watermark them and write a post about the entire experience! Yes, there was indeed a sense of urgency! The brownie base. In my opinion, brownies have to be gooey. If they’re not gooey, they’re not a brownie! 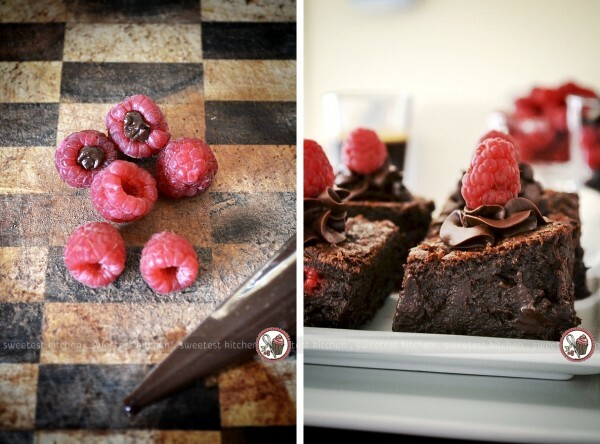 I chose my absolute favorite gooey brownie recipe and added to it raspberries, dark chocolate chunks and one entire capsule of Cioccorosso, which was infused into the melted chocolate and butter. To infuse the coffee grounds, you simply tear the foil off a Cioccorosso capsule and empty it over the bowl of chopped butter and chocolate. Then simply place the bowl over a saucepan of gently simmering water and melt as usual. Don’t worry about the texture of the brownies being gritty because of the coffee grounds; you won’t even notice it! Infusing the coffee this way ensures you get the flavor of the coffee in the finished brownies. My brownie recipe, with the exception of melting the chocolate, is a one-bowl recipe and uses just a handful of quality ingredients. In just a matter of minutes, you can have the chocolate mixture melted, and the rest of the ingredients whisked and folded. Just before placing the batter in the tin, I added a handful of chopped dark chocolate (70% cocoa) and fresh raspberries. I had a fleeting thought to add some chopped nuts of some kind, for texture’s sake, but I wanted the focus of the flavors to be on the raspberries, chocolate and coffee. And not a lot of people actually like nuts in their brownies. Hands up – do you like nuts in your brownies? To get an idea of what the brownies may taste like, of course I tasted the batter leftover in the bowl! Oh wow! 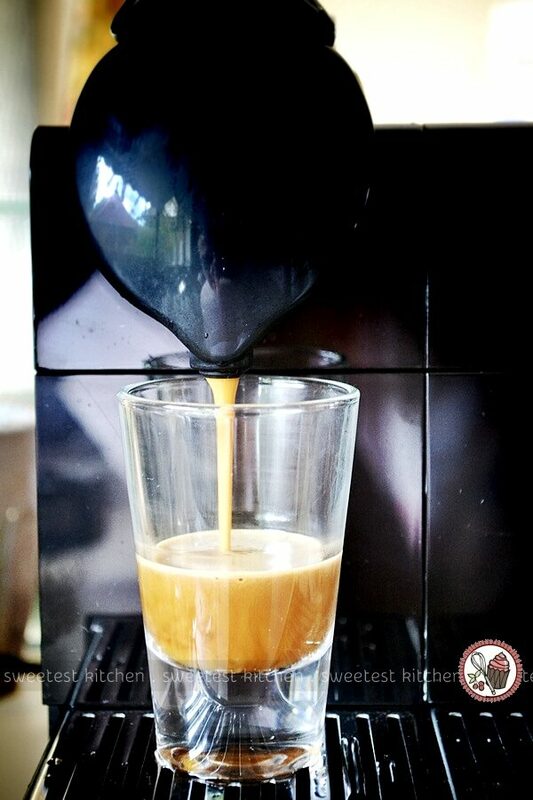 It was perfect and tasted just as I wanted it to taste; the flavor of the Cioccorosso capsule was definitely there. I was concerned I wouldn’t get the right level of gooeyness and would end up overbaking. I checked on the brownies at 30 and 35 minutes and gave the tin a little shake; it was wobbly. A few minutes longer and another shake showed me the wobble was still there, but only just. I took them out of the oven at that point, knowing they would keep cooking for a few minutes after I took them out. These brownies looked so gooey that I had to let them completely cool, otherwise they would not have been easy to cut. Ideally, I wanted to wait until the next day to cut them, but I just didn’t have the time. Once cool, I trimmed the edges off the brownies (no, I’m not into brownie edges!) and cut this delicious slab of chocolate gooeyness into squares. The final touch to these brownies is the ganache, which again is infused with the Cioccorosso flavor. This was done rather easily and involved using a clean teabag (I cut a mesh tea bag open, emptied the contents and washed the bag in plain water until the smell of the tea had vanished)! I wanted to infuse the coffee into the ganache, rather than use the grounds, because who likes gritty ganache? Into this clean tea bag, I poured a capsule of Cioccorosso and tied the open ends into a little knot. I placed this bag, open side up, into the cream and heated this infusion slowly. Careful not to let the cream get too hot (no simmering or boiling), I let it go as long as possible, swirling the bag around the cream gently. It turned a nice golden color, and yes, some bits of coffee grounds did get in, but not many. And the flavor was beautifully infused; the ganache tasted great! As the ganache was setting, I took a couple spoonfuls of it, placed it into a piping bag and cut a small hole at the bottom of the bag. I actually piped the ganache into the raspberries! I have always wanted to do this! I ended up placing the berries open side down on the brownies, but if I were to do it again, I would place the berries open side up, so that you could see the ganache inside. Once the rest of the ganache had set slightly, I piped a little swirl on top of each brownie and placed the ganache-filled raspberries on top. I just have to tell you again how wonderful it smelled in my house. The entire house was flooded with the smell of baking brownies, and the kitchen itself seemed infused with the scent of chocolate, with a hint of coffee, as we had the Lattissima machine going as well. It was a gorgeous smell, like a fancy chocolatier’s shop! Of course, no one got to taste any of the brownies until the photographing was done, which was indeed an excruciating wait! But look at that gooeyness! Here I was, concerned I would overbake them and not have the time to make another batch, but in the end, maximum gooeyness had definitely been achieved! They looked lovely and exactly like my idea of a perfect brownie. The raspberries looked great studded throughout the squares, and here and there were the melting chocolate chunks, just oozing out the sides. This, my friend, is heaven. Tasting time. This was the ultimate moment, the moment we had all been waiting for. The kids just wanted to dig in (and they only got half of a square each, mind you! ), but I needed to know how they tasted and what flavors came through. I was not disappointed. Not at all. They were perfect. Every flavor was there – the chocolate, of course, but also the raspberries, which were a burst of freshness, and the underlying deep, dark notes of coffee, which complements chocolate so well. 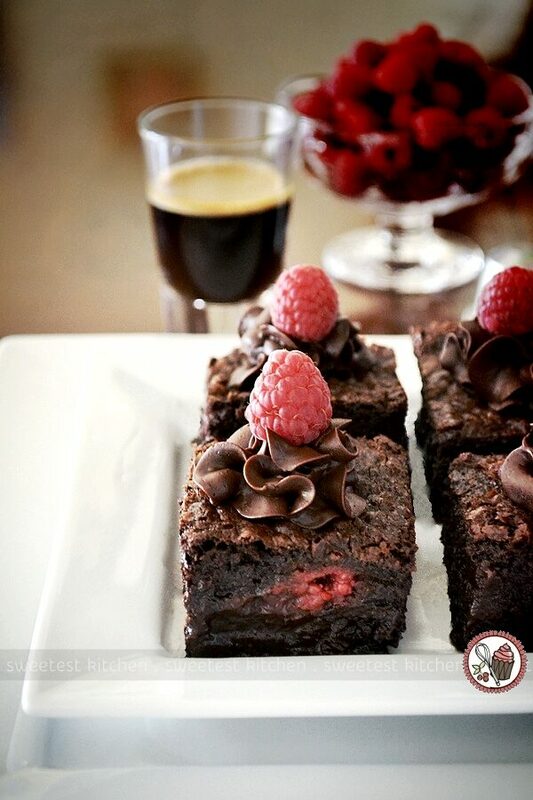 The only way I could think of to easily describe these decadent brownies is by comparing them to a raspberry mocha made with the darkest of chocolate, the finest Grand Cru coffee and the freshest, juiciest, sweetest raspberries. I think these brownies truly reflect the beauty of Nespresso’s new Cioccorosso and am very happy with how they turned out. In fact, we were all very pleased with these beautiful brownies, and I highly recommend you give them a go, too! They were so fun to bake yesterday, while it was pouring down rain outside. Imagine sitting in your cozy chair, with a cup of steaming Nespresso and one of these brownies, and watching the cold rain bucket down outside. Heaven! 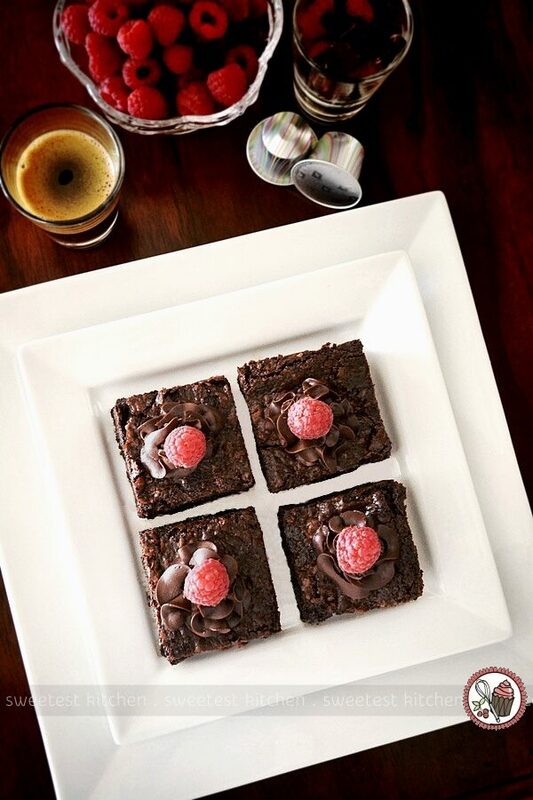 So, what do YOU get out of this competition for Australia’s best chocolate raspberry brownie?? Well, besides giving you an awesome brownie recipe, the winning blogger will run a giveaway where you will have the chance to win a Nespresso prize pack worth $390. The pack includes a Nespresso U Milk Machine (RRP $299) as well as a Glass Collection of Cups (RRP $50) and 5 sleeves of Cioccorosso (RRP approx $40). The winning blogger also receives a cash prize. The entries will be judged by chef Simmone Logue on Monday, November 18. Judging will not only be based on the quality of ingredients, how easy it is to make, food styling & photography, but also on feedback from Nespresso’s fans, so the more people repin my brownie photos from Nespresso’s Pinterest competition board, the more likes and comments on my brownie photos on Nespresso’s Facebook page, and the more comments you leave on this post, below, the more chance I have of winning and of giving you a Nespresso prize pack. **I was not compensated for this post, however, I did receive free samples to review and create some yummy recipes with. All opinions are my own and not influenced in any way. 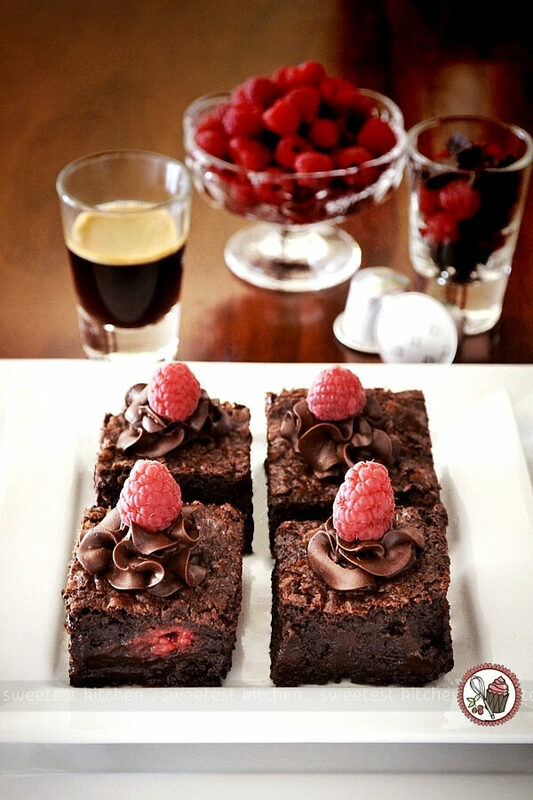 Dark chocolate brownies, studded with fresh raspberries and dark chocolate chunks, and infused with the flavors of Nespresso Cioccorosso. Preheat oven to 190C (170C fan-forced). Grease and line an 8x8-inch square baking tin. 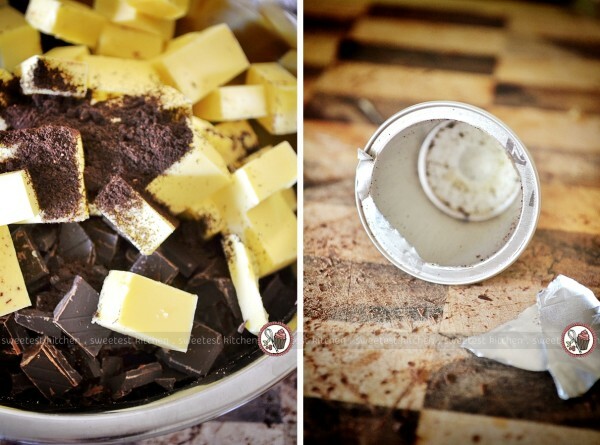 Place butter and 350g chocolate in a heatproof bowl. 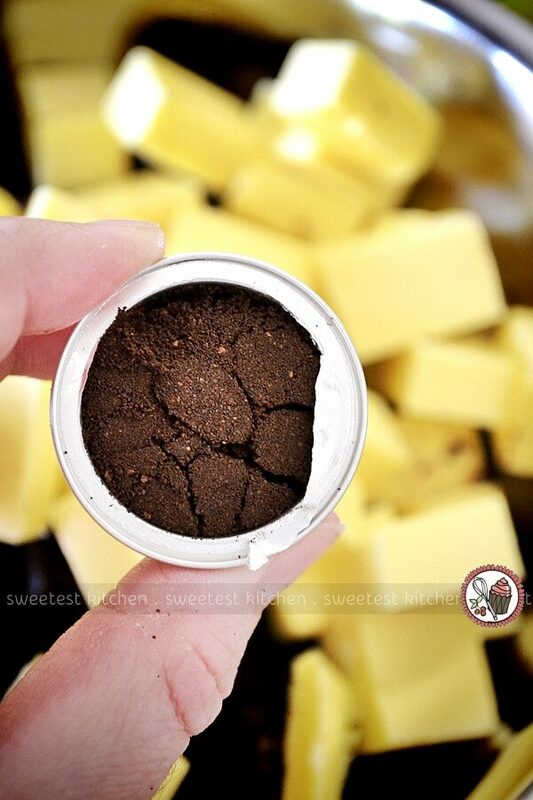 Carefully open Cioccorosso capsule and empty the coffee grounds over the butter and chocolate. Place the bowl over a saucepan of gently simmering water (water should be about 1-inch high). Stir occasionally until the mixture is melted and smooth. Do not allow any water to come in contact with the mixture. Set aside. Whisk eggs in a large bowl until pale and fluffy, but not too stiff. Add brown sugar and whisk until thickened. Gently fold in the melted chocolate mixture. Sift in the flour and gently fold until just incorporated. Add the 150g dark chocolate chunks and 1 punnet (125g) fresh raspberries and gently fold in. Transfer the batter to the prepared pan, smooth the top and bake for 30-40 minutes. The brownies are ready when either a wooden skewer inserted 2 inches from the edge comes out with quite wet crumbs, or if you give the pan a little shake you'll see it slightly wobble. It'll finish cooking in the tin once removed from the oven. It should most definitely be gooey! If in doubt, underbake rather than overbake. Allow the brownies to cool completely in the tin. Place the chopped chocolate in a heatproof bowl and set aside. Pour cream into a small saucepan. Open the Cioccorosso capsule carefully, and empty into a cleaned tea bag (or similar) and tie a small knot from the opened ends. Carefully place the bag into the pan with the cream, knot side up. Heat slowly and gently for at least 3 minutes, being careful not to let the cream simmer or boil. 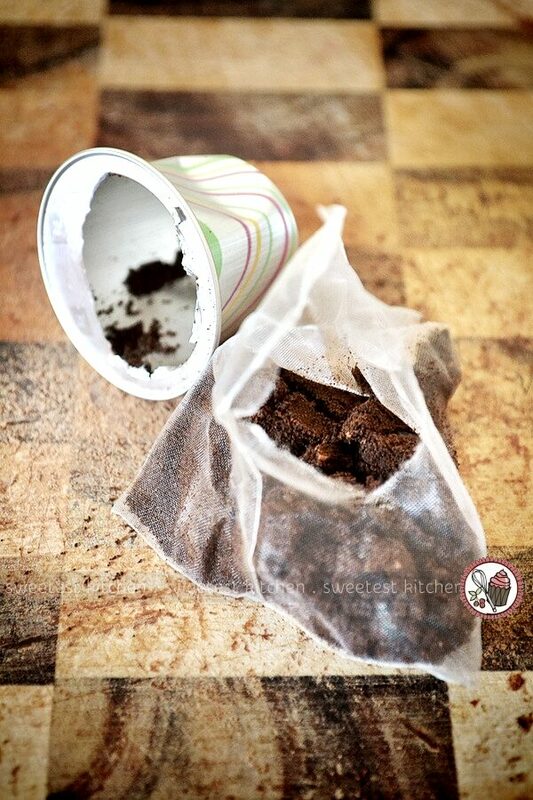 Remove the coffee bag, squeeze repeatedly to get out all the coffee juices and then discard. Pour the cream over the chopped chocolate, stir, and allow to sit for 1 minute. Whisk the mixture until smooth and all the chocolate melted. If the chocolate doesn't melt, place it over a saucepan with simmering water (do not allow the bowl to touch the water, water should just be an 1-inch high) and whisk until smooth. Set aside. Pour a small amount, about 2 tablespoons, of the ganache into a small piping bag and snip off the bottom tip so that there's a small opening. Squeeze the ganache into the leftover raspberries (you should have 12-16 brownie squares, depending on how big you cut them, so use however many raspberries as you have squares) and set aside. Empty any leftover ganache back into the ganache bowl and allow the ganache to firm up (either at room temperature or in the refrigerator) just enough so that it's pipeable and will hold its shape. Spoon the ganache into a larger piping bag fitted with a star nozzle and pipe a small swirl on top of each square. Top each swirl with a ganache-filled raspberry. Serve immediately. Store leftover brownies in the refrigerator. Let come to room temperature before serving, if desired. In my opinion, these are best served same day. They look amazing! and the piping of the ganache into the raspberries! Don’t think I’d ever even consider doing that. I might give these a try myself 🙂 and in regards to nuts in brownies, I love them with pistachios. Thanks, Kalliste! I had seen ganache-filled raspberries before but never had a reason to make them myself. This seemed like the perfect opportunity! They’re great just on their own too, like a little raspberry truffle! wow, these look wonderful. thinking about doing them for one of my cake fridays. They look amazing Jamie. I’ll have to make these. It’s so Gooey I could die! They look great! You are really very creative! I love these brownies. Beautiful!